Welcome to SitcomsOnline Digest! This week, we have yet another Wonder Years music update, news of some CBS DVD complete series releases, and more. Let's get started! Last week, we told you about The Wonder Years - The Complete Series, and the list of original music that will be included in the set. We also gave you an unofficial list of what music may be missing, but as it turns out, StarVista has also provided an official list of missing music, and what those songs have been replaced with. You can see that list here. The Real McCoys has been a disaster when it has come to DVD releases, with one studio releasing the first four seasons (before going bankrupt), followed by another studio that promised even better results and even planned a complete series release, but only got so far as to re-release TWO of the first four seasons that had already been released. Now, SFM is taking matters into their own hands by releasing each season as a MOD release on amazon.com. Warner Home Video has been talking about releasing the series Spenser: For Hire on DVD for years, but never took action. But now, it seems that Warner Archive is taking action, and will be releasing the first season at some point in the near future. CBS has two complete series sets on the way for November 11 with Family Ties - The Complete Series and Taxi - The Complete Series. While Family Ties has already been released as a complete series set, this version will come at a much lower price (but without the extra bonus features included in the previous release). 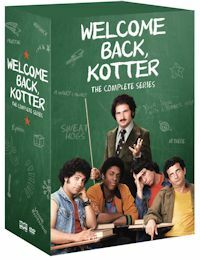 Welcome Back, Kotter - The Complete Series (DVD, $129.98): The Sweathogs, along with Mr. Kotter, Mrs. Kotter, and Mr. Woodface... err Woodman... all come together with every episode of the series on DVD from Shout! Factory, along with the special features that were presented on Warner Home Video's release of the first season. Who to Follow: Every.Simpsons.Ever (Twitter), "Marathon HAPPENING NOW on FXX. Coming to FXNow This Fall."